Shaded or gradual tones as seen in the world of fashion and textiles for centuries, here fashioned into a cake. This version is done in yellow for Summer! This recipe is fashioned for two, with leftovers for later…. Out of the ordinary tools for this project are Williams-Sonoma 6″ cake pans and I originally used Americolor colors (first photot) since I became accustomed to them with my cookie decorating vendor, but tried it using Wilton colors (second photo) which are much more readily accessible at most craft/party stores and it also worked out fine. As you can see from the two photos, the color range is completely up to you. I used a Wilton 1M tip to decorate this, yet when I was at the store discovered that my tip is different from the tip sold in stores now – I purchased one and simply bent the prongs inward to create a closed-star. 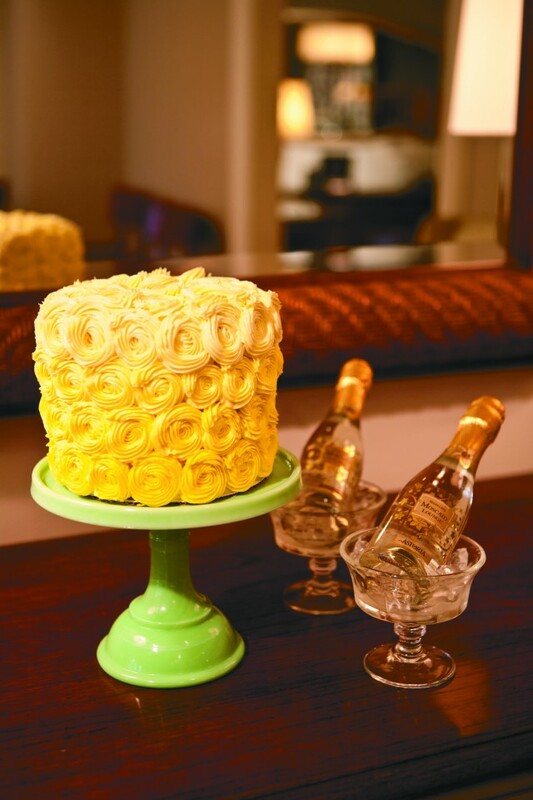 As with frosting any cake, refrigerating it so it is completely chilled will ensure a much easier frosting experience. For this cake, I suggest refrigeration before you do the crumb coat and before you pipe the final layer. I use one, 9.5 c container of my Vanilla-Bean Buttercream frosting, which I then tint as needed. This will make a four-layer cake. Prepare 4, 6″ round cake pans by spraying them with Bak-klene or butter/flour – preheat oven to 350 degrees. In the bowl of a mixer fitted with the paddle attachment, cream butter and sugar together – then add eggs one a time until incorporated, followed by the buttermilk. Add baking powder, soda, salt and vanilla bean paste – stirring to combine. Add cake flour and mix until batter begins to look creamy. Divide batter evenly into three bowls, AND one prepared cake pan (this will be your uncolored layer). To the first bowl add a tiny amount of desired color and stir to combine with a fork. Scrape into one of the prepared pans – set aside. In the second bowl, add a larger amount of color so your next batch is more vibrant, stirring with a fork to incorporate. Scrape into one of the prepared pans – set aside. In the third bowl add a larger amount of the color, adding more if necessary – so it is a level darker than the last, stirring with a fork to combine well. Scrape into one of the prepared pans – set aside. Place prepared pans into preheated oven and bake for 20-25 minutes, until tester comes out clean. You may need to move pans around if your oven has hot spots. Remove from oven and let cool for 15 minutes, then invert cakes out onto rack to cool completely. Wrap with plastic wrap and place into refrigerator to chill fully. Remove from refrigerator when you are ready to ice layers together and put on crumb coat.